And time told it did. Who cares about who went home?!! How about that Adam Lambert performance, folks?! Now THAT's a performance!!!! And how cute was Adam to Seacrest like a little kid at show-and-tell: "I brought lasers!" Yes you did, Adam. And they rocked my world! A bejewled ear piece, a full blown laser show, some crazy watery-type cone bubble Adam stood in for the first quarter of his performance ... once again, Adam proves why he is a true original and why those silly kids should have heeded his advice last night!! Oh yeah, Andrew and Katie went home. Whoop de freakin' do. I'm gonna rewind me some of that laser show! They should turn AI into the Adam Lambert Show for next year. Who could ask for anything more? 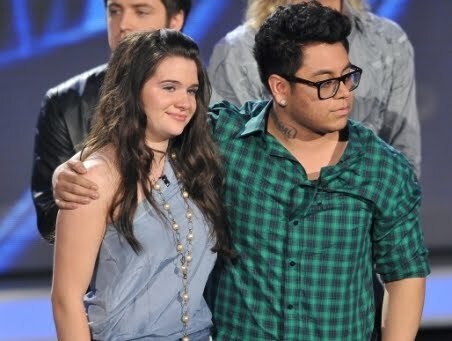 Kind of sad that Katie went home, I though she was better than Aaron, however I am a HUGE Lambert fan and thought everything he did was great on the show, including being painfully honest with the contestants, and I hope Simon is eating crow at how popular Adam has become since Idol, he is definitely a showman. Adam's Performance was absolutely AMAZING! On the other hand I totally think that Mike should have gone home instead of Andrew! I guess I just dont understand how he should have gone home last week and now this week he isnt even in the bottom three! Once Seacrest ssid that I thought for sure it was going to be Mike going home instead of Katie but what can you do! Adam Lambert's a well trained entertainer. He is excellent in song adaptation and staging performances.The late Freddie Mercury has been listed as #1 rock singer for three straight decadees, had a multioctave tenor voice, could sing his falsello in full voice. Finally after three decades, Adam Lambert is also a tenor, with multioctave vocal range sings his falsetto in full voice.Adam Lambert really is the magnificent singer all the Ai judges,mentors,guest singers,vocal coaches,and music critics labeled him last season. No wonder he was voted #1 Artist Of 2009 by Rolling Stone readers. His four concerts this year all sold out, his CD is being released in the UK this month -he has some concerts there-then his USA tour start in June and Orianthi will be his opening act. Wonderful entertainment to look forward to. thanks for your comments, guys. it's funny how quickly people want to chime in when it comes to something that excites them!! bringing me back to season 8 when i would put up a post. (sniff. sniff.) i swear i have only watched this 10 times today. and it give me chills every time. especially that beginning part right when it cuts into the chorus ... oh baby!